Note - the arms of the cradle can be bent to suit the shape of the item being held and method of suspension. 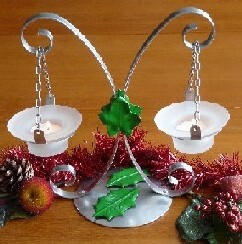 Our range of glassware candle holders are primarily designed as tea light holders. However, when combined with metalwork and wrought iron work you can create fantastic looking lighting projects for indoor or outdoor use. Some of these items can sit in rings or bent metalwork created won our RBR tools or XL5+ Power Bender or they can sit in some of our other candle holders and trays.